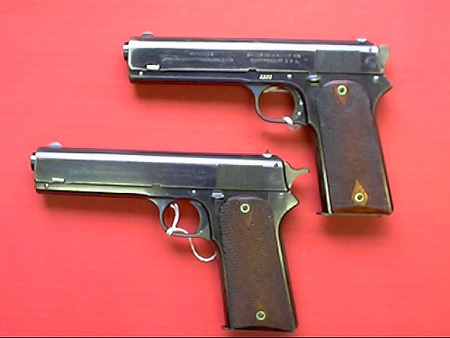 These Colt 1905 pistols are .45 caliber semi-automatic handguns made by John Moses Browning at the request of Colt. The pistols were designed to fire a 200 grain bullet. The Colt 1905 was one step in the evolution of handguns that would eventually become the M1911 pistol adopted by the US Army. The 1905 was single action but did not have the classic grip or thumb safeties found on the 1911.